If you're a writer, you probably think constantly about getting away from it all. In solitude you could craft the Great American/British/African/Asian/Wherever-you're-from Novel, but as it stands you have too much washing up to do, too many groceries on your list, too many kids to look after, too much work, not enough time, no space, no peace and no bloody quiet - aaaargh! That's where Fin-Duck could come chugging to the rescue. The owners describe her (because every ocean going vessel, no matter how ungainly, is always a 'her') as 'a boat, a sauna, a duck, a summer cottage powered by an outboard motor'. Just think what incredible literature you could compose in her belly, tucked away from the world and drifting in bliss with the current. You could take shorts breaks from your work by popping into the sauna. You might ask why this makes a better writers' (or just writer's if you can afford to rent it on your own) retreat than a 50-foot luxury yacht which might, the price of airfare to Finland factored in, set you back about as much. Well, a 50-foot luxury yacht isn't a giant floating duck, complete with its own sauna, is it? You're not just retreating from distractions, but you're floating away from sanity and sense. You're doing something a little bit crazy and the spurt of self-congratulatory excitement caused by this might just inspire you to write and write and write. Of course, you could just get onboard the duck and think, what the hell am I doing? I'm not used to working on a floating duck and now I can't write at all. I'm stuck. I want to go home. I have washing to do, kids to feed, other jobs to get out of the way. Oh, if only I was tucked into my special desk/shed/cupboard/pub/cafe where I feel safe, but instead I'm trapped on a floating duck with a sauna, and I don't even like saunas. I suppose what I'm saying, in the most roundabout way imaginable, is that I think the best place to write is the place that you're used to. 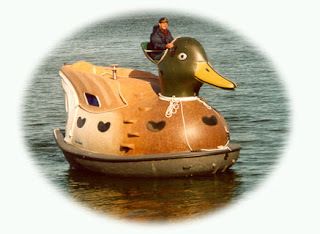 But the floating duck does look cool and I wouldn't mind renting it for a bit. And, no, I haven't been paid by the Fin-Duck company of Finland to promote their product.